As reported by USA Today, n4a launched a national public education campaign, in collaboration with AARP Foundation, to spread the word about the growing problem of social isolation and loneliness affecting millions of older Americans. 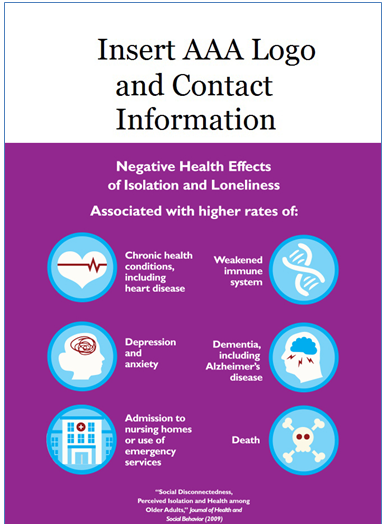 It is estimated that one in five adults over age 50 are affected by isolation, a problem that has been associated with higher rates of chronic disease, depression, dementia and death. This topic is the focus of the annual Eldercare Locator Home for the Holidays Campaign, developed to encourage discussion of important issues affecting older Americans at a time of the year when family and friends often gather together. Past campaigns have focused on strategies to help older adults transition to a non-driving future and steps they can take to improve their brain health. This year’s campaign will be conducted through January 2017. To help educate the public and key stakeholders about this issue, n4a produced a consumer brochure: “Expand Your Circles: Prevent Isolation and Loneliness As You Age” and a handy toolkit with all of the resources AAAs need to support the campaign in their communities. To order the brochure, please visit the Eldercare Locator online store. Find campaign media coverage here.